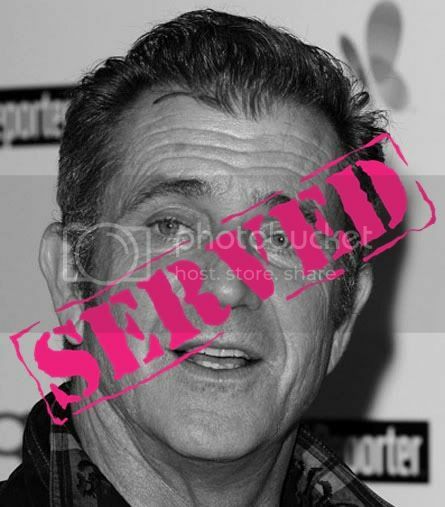 SERVED: Oh Mel Gibson, you're in big trouble now. A few years back Mel had that drunken racist rant to a police officer and we all laughed it off a bit at the time. Now Mel Gibson is a getting a huge SERVING for allegedly physically and mentally abusing his girlfriend, who decided to prove his terribleness by recording their phone conversations. He's nucking futs on them! While moments can be hilarious (the oh so quotable "You should just smile and blow me!" or "Blow me first! "), the rest is pretty violent and racist. Mel got SERVED pretty hard right after the tapes leaked, getting dropped by his agency. Now they are trying to say the tapes are fake, that the photos are doctored. If this were any other normal average person, the man would be arrested, but because he's famous it's suddenly doubted. Since I'm just an average person looking in, the man looks pretty guilty but I won't declare this as fact cause I am just a ranting blogger just know that as I see it, ya got SERVED. Think someone should get SERVED? Leave your ideas in the comments section, email me, or hit me up on Twitter or Facebook.